Opera doesn’t only happen in opera houses. Don’t get me wrong — I love opera houses. When I lived in Italy, I embarked upon my own personal “Opera House Tour,” visiting famous opera houses from Milan to Palermo. I have nothing against sweeping staircases, painted ceilings, gilded ornamentation, glittering chandeliers and plush velvet seats. The acoustics in many opera houses are wonderful. And there is a special joy in singing to a house full of opera lovers! But opera is a thriving and dynamic art form; it cannot be contained! People are singing opera everywhere these days: on lakes, in parking garages, and in Swedish living rooms. Travis Pratt even sings Rossini in elevators. Personally, I love to sing outdoors. Some of my favorite concerts have been outside: on a Hawaiian beach, in a friend’s backyard, in the middle of the Sequoia National Forest, and in the courtyard of an ancient museum in Nepal. I occasionally sing while kayaking and parasailing. For me, there is something thrilling about singing to the ocean. 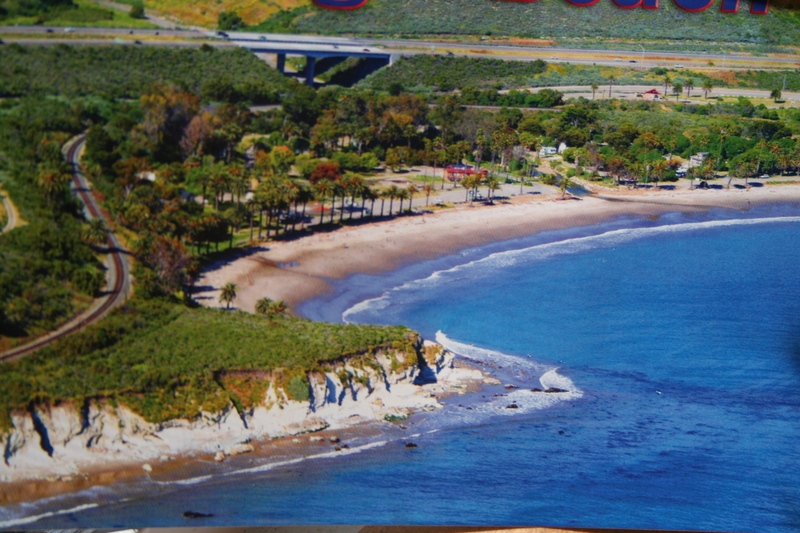 Last week, I went beach camping with my family near Santa Barbara. It was a wonderful vacation, but I didn’t really have anywhere to sing. So one afternoon, I hiked up on a a little cliff and sang Gershwin to the sea: “Summertime, and the livin’ is easy…” It felt great to sing in the open air. And at the end of my aria, I was rewarded with applause from the beach below! My audience consisted of 1 snorkeler, 2 kayakers, a few hikers, and several seagulls. Spontaneous concerts can be fun. 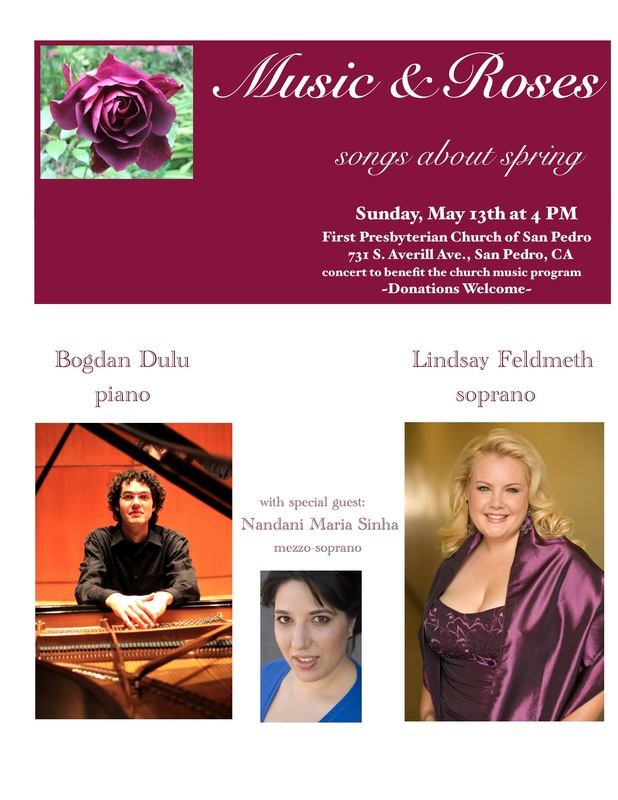 Please join me on Sunday, May 13th at 4 PM at the First Presbyterian Church of San Pedro for a springtime concert. There will be some fun surprises, including special guests and exciting music. It’s Mother’s Day, so treat your mom to something special, a bouquet of MUSIC AND ROSES!!! Our festival of spring will include a wide variety of songs, arias, opera scenes and concert pieces. Works by Puccini, Verdi, Schubert, Bartok and more! At the piano, you’ll experience the award-winning Romanian pianist Bogdan Dulu! First Presbyterian Church of San Pedro, 731 S. Averill Avenue, San Pedro, California. Admission is free. Donations will benefit the church music program.